I couldn't make the Preemptive Strike opening yesterday afternoon, and I can't make the event this coming Thursday either. To save myself from making a whole trip up from the shore on some other day to see it, I decided to go today during the break between my early and late classes. It's only several miles from my university, though not a route I'm used to traveling. Got my map, figured out a way that involved only a few turns after leaving my parking lot, and set out, passing through bits of Elizabeth, Roselle, and Linden (birthplace of my former pickup truck). About a twenty minute trip in the sprinkly rain. The schedule had my 4 pieces in 3 different locations. The first one I spotted was my boardwalk image in the main room of the building, second from the left in the photo above. Next up was the saint print, which I found in one of the alcove spaces (above) off the hallway toward the back door. When I went in there to photograph it, I spotted my smoking piece on a different wall in there (below). I was a little surprised because I had been told it would be in one of the window display spaces down the street. Later Doug told me he didn't have enough of the hangers he needed for all the windows, so my piece was one of many that ended up back in the main building. So she's not in her natural street habitat, but she'll be seen whenever people come in to see the show. And I didn't have to walk in the rain to see it. My fourth piece was still scheduled to be in the Arts district office down the street, but I was told that the work hadn't been hung in that location yet, but would before Thursday night's street event. However, I was able to see Molly's robot blocks, which were displayed in a tower construction back in the main room. Before leaving, I picked up my copy of the exhibition catalog, for which I had submitted a photo of the boardwalk print. The image looked good, but once again my name was misspelled. It was right on the wall labels in the show. 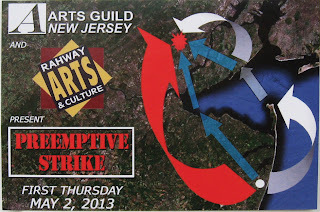 The Preemptive Strike show remains on display at Arts Guild New Jersey in Rahway through May 30, 2013 during regular gallery hours and by appointment. It will be also be open during the First Thursday street event this coming May 2nd. 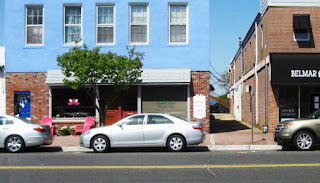 Today was the day of the Belmar Art Walk. I got there a little before my scheduled work "shift" to check out the situation. My host had indeed brought a small table from home so I didn't need to go get one elsewhere. Since it was a beautiful spring day I decided to set up out on the sidewalk. I had the option of working inside, but I figured few would make their way past the other artist outside and go in to see me. It was too breezy out there to put out any kind of paper, so all the promotional cards I made stayed inside the binder and would just offer to hand one to anybody who expressed an interest in what I was doing. Some years this event can be pretty dead, but today the streets were busy, no doubt at least partly due to the weather. However, the shade gradually crept across my location, then clouds blocked all the sun, and it got quite chilly. When my two hour slot was done, I was very happy to pack up and head to my next scheduled stop, an indoor location. Above you can see the day's progress on the new block. I spent time talking to friends and family who came by, as well as anyone who stopped to look at what I was doing, but I still got a bit done in my limited time. 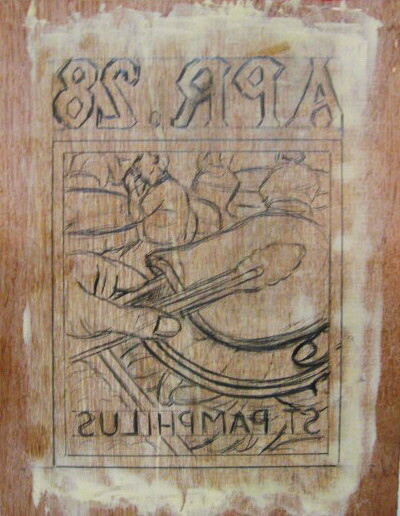 I outlined the exterior, cut out the whole date, and started working on the plate and pancake. There are a few things to fix in the drawing, but I should be able to continue cutting during the coming week. At tomorrow's Belmar Art Walk I'll be demonstrating woodblock cutting as a way to try to build interest in my upcoming BAC woodcut class. That means I need to have a block to cut. A few days ago I decided to start a new saint with a feast day matching the date of the demo, April 28th. The book had 10 saints for this particular day. Most were not particularly exciting. One possibility was St Cronan of Roscrea, an early Irish saint for which there was no contemporary information, but a later story mentioned something about producing a very large quantity of beer through some miraculous means. However, I already have a beer themed saint from the original set (St Lioba September 28th) so I looked further. I settled on St Pamphilus, an 8th century bishop. Typical story with a common enough theme- a very zealous religious leader whose intense devotion and practices annoyed those around him until he was accused of heresy to Rome before he proved himself innocent of those charges. The biography mentions that on Sundays he woke up around midnight, said his order's traditional night prayers, then jumped into a mass, hours earlier than anyone else ever did. Then at daybreak he'd prepare a meal for the poor and share it with them. The meal thing had possibilities. In the weeks following Hurricane Sandy there was a lot of food giveaways. Restaurants in the shore towns around here set up outdoor grills and cooked and gave away their inventory, since there was no way to preserve the perishables for very long. Of course churches took up the slack after that- in my former town of Manasquan you could visit a different church for breakfast, lunch, and dinner every day for weeks. People don't usually associate these beach towns with poverty, but post-hurricane a lot of people were (at least temporarily) homeless, out of work, and lacking access to things we had come to think of as basic needs. One of my Manasquan neighbors was in the habit of making the daily rounds for free meals, and I got word from him that breakfast was a sit down deal- place your order and they brought the plate to your table. However, much more common (as in photos I found online) was a line of steam trays and the guests getting their plates filled cafeteria (or perhaps soup kitchen) style, and I thought that would be a better visual. 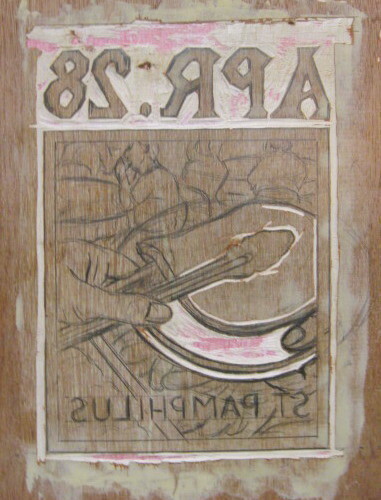 Earlier versions of the pencil sketch showed a wide view of such a table, and a cropped view of a server and someone having a plate filled, but in the end I went with a more close up view of a pancake held by tongs, no more than bits of the hands of the server and diner, with small bits of steam table and other diners in the background. Some things in the above sketch are not quite worked out, but enough is that I'll have stuff to keep me busy for the two hours. 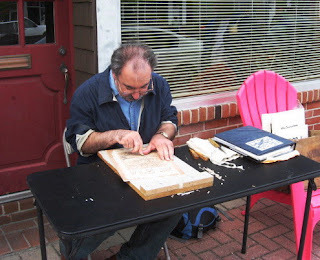 Tomorrow afternoon I'll be demonstrating some basic block cutting in downtown Belmar as part of the annual Belmar Art Walk. I was late to volunteer, so at first I didn't know where I might end up. Then I got an e-mail from the organizer telling me that I'd be either inside or in front of a yoga studio on Main Street, and gave me the address. Saw on a map that it was on the block between 9th and 10th, on the side closer to the train. I parked in the plaza parking lot, then walked through the plaza to Main. Before long I came to the place above with the green awning with "yoga" in bright purple letters. However, through the window it looked long abandoned, dusty, cracked tile. And the address did not match the one I had been told. I walked south about 3 or 4 more storefronts and came to another yoga studio. Much larger, and this location was furnished. Not open that morning, but looking like it was functioning business. But again, the address didn't match the one I was given, nor did the name on the door. Again I continued south, passed another 3 or 4 businesses and then came to my destination, the building with the blue top and the pink chairs in front. This is Bella Buddha, at 921 Main Street. It was closed that day, but I went back yesterday and spoke to the owner. She verified that she'd be open and expecting me. So if you want to see some free woodcutting, stop by on Sunday from 1 to 3 pm, then check out the rest of what's going on along Main. And if you're looking to do some yoga, this one block seems to be the headquarters for the region. This coming Sunday I will be doing demonstrations of block cutting in Belmar as part of their annual Art Walk. I don't usually participate in this event, but it occurred to me that this could be a useful way of promoting my woodcut class, which is scheduled to run at the Belmar Arts Council a few weeks after that. That means I have to come up with a block to cut, and when I need a sample block and don't have something already in progress, I often start up a new saint. I've done about 75 or so of these saints. My source for saint stories, Butler's Lives of the Saints, has thousands of options. My first plan was to consult my original notes from mid 90's, when I read the whole thing. 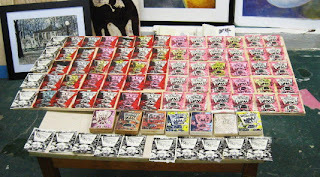 I used those notes in the run up to my MFA show, cutting 66 blocks, 61 of which made the show. Most of the ones done since were done by looking up specific requested dates and going from there. A few have come from looking up a specific saint by name. There have been a few occasions when I needed an idea and just pulled out the notebook and looked for an interesting story that didn't get done in that original batch. I last saw this notebook early in the year (it had notes useful for one of my current college classes), but despite an extensive search earlier this week, it hasn't turned up. I next considered just reworking an old print. Though I still have at least one copy of all the prints, all but 29 of the original blocks were destroyed by Sandy. If someone really wants to buy a print that I don't have the block for, it would probably be worth it to just recut the block. 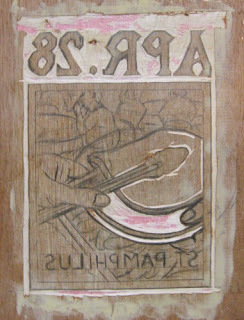 Working from the original print, it wouldn't take long to redraw the composition and then cut the new block. Last week on a day in the Studio I catalogued which ones survived, and I suppose I could have picked a saint that had sold in the past but is no longer available to reprint. In the end I came up with a different plan. The day I'm going to be doing this demonstration is April 28th, so why not that day? Maybe someone sees the demo and realizes how I can work from a request for a specific day and gets the urge to commission one. I checked my master list and the day hasn't been done yet. I went through my copy of the April volume and found suitable idea. I'll save that story for when I start the drawing, but today I dealt with the necessary step of preparing the block. Went up to the Studio, cut a nice piece of lauan, and gave it a layer of wood filler. (didn't have the camera with me today, but it looked pretty much like this) Turned out all my sand paper was in the bag of supplies back at my apartment, so I'll deal with that tomorrow. 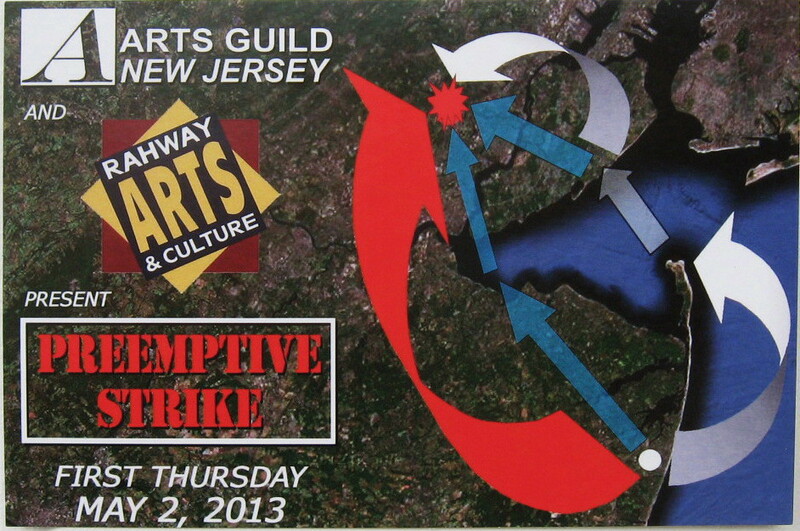 Today was the scheduled day to deliver our works to Rahway for next week's Preemptive Strike show. All the artwork was ready by last night, so the only thing I did this morning was look over the map one more time to remind myself of the landmarks along the way. I left late morning from home, made excellent time getting up to Union County, and found plenty of empty spaces in the lot behind the Arts Guild building. Doug Ferrari was inside to greet the arriving artists, and a few others were around while I was there today. He dispersed my four pieces among 3 piles of artwork, reflecting which of the three locations each is intended for. I have at least one going to each place. Before getting back in the car, I decided to walk down the street and check out the other locations. The bulk of the work in this 30 person group show will be there in the main building at 1670 Irving. I'm scheduled to have two pieces there- my boardwalk wheel game and St Benno. The other art will be further into the Rahway Arts District. Two blocks south is a theater, and next to that the Art District Office, 1591 Irving. 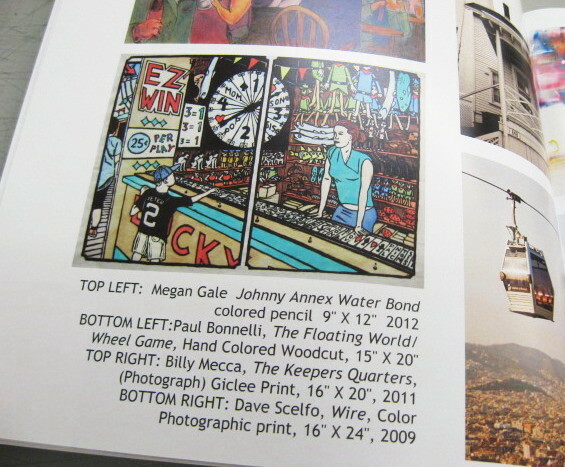 My History of Art print will be there. 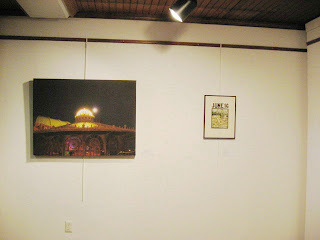 This piece had been in the show Molly and I were in several years ago, so I'm kind of glad it ended up in a different building. Starting on the next corner, at least a bunch of the next block is empty storefronts. Relatively modern building, spaces look clean and maintained, just no current tenants. My fourth piece, the smoking portrait will be going in one of the empty windows. Seems like a perfect location, since my subject is a woman leaning up against the brick exterior of a building. Some might even think that it was created specifically to be shown there. Don't know the specific address yet, but they are across from the YMCA, which I think was in the 1560's. And speaking of the YMCA, Doug mentioned that there was some kind of art flea market going on there and suggested that I check it out. There were tables in a center cluster and around the perimeter of the room, maybe around two dozen. Most of it not particularly exciting. 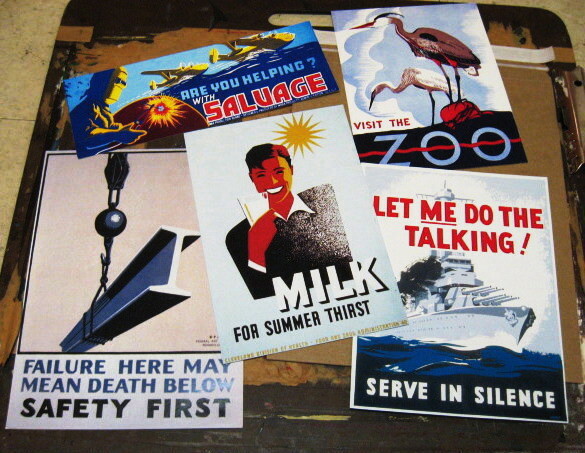 I did find one thing worth buying- one table had a bunch of mini posters, reproductions of WPA produced posters. The largest one (see above) is about 9" x 12", all printed on glossy heavy stock. Only a quarter each, or 5 for a buck, so I got five. Wish I had them a couple of weeks ago when my Visual Thinking class was starting their poster project, but I'll still bring them to school and show them to the students. After that, I headed home. There are two official receptions for this show. The first is Sunday, April 28th, from 1 to 4 pm. Then on Thursday, May 2nd, there's a First Thursday art event, with the galleries open 6 to 8:30 pm, and live music as various locations from 8 to 10:30 pm. I can't make either one, but will find a day to check it out soon, and probably get some photos of the installations. The way things work in the art world (my piece of it anyway), is there are long periods of time when nothing is going on, then suddenly everything is going on. I'm always busy, but sometimes there are a bunch of things that can't wait. Coming into this week I had two big art things to deal with. I had arranged to be part of the Belmar Art Walk the last Sunday of April. Businesses up and down Main Street will be hosting art shows and art demonstrations. Since I had planned to run another series of woodcut classes around that time, it seemed a good opportunity to promote that class, and I'm no stranger to doing demos. By the time I decided this, it was a bit past the deadline to sign up, but I guess they need people. The details of where and when changed a bit, but in the end we settled on a demonstration either in front of or inside a yoga studio, which seems to be part of Belmar's yoga district. (I'm not kidding- three yoga businesses within 50 feet of each other on the same block) Anyway, now that I have the promotional event set up, I need something to promote. I had stopped by the Boatworks a few times to check the building calendar and sought input from potential students. Only a week to go, so today I committed to some dates in May and June. Now I have to come up with a project to demonstrate, but that's a problem for next week. Probably a saint. The other thing coming up fast is the delivery of work for the Rahway event. 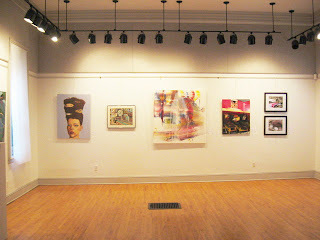 The show opens next weekend and again late the following week, but the work has to arrive tomorrow. Luckily this wasn't too difficult. 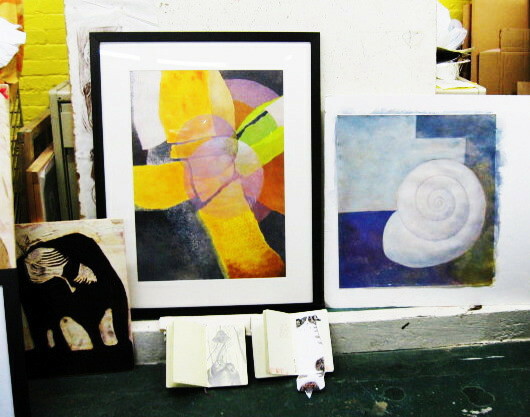 The three largest pieces are all in frames, stored right in my living room and already wrapped for travel. The fourth, a saint, needed a frame. When I last showed it, I had it in a frame a little larger than the ones I had used for other saints, but it was now holding the piece I did for Animal Spirits last year. I found the window mat that fit the frame and the saint, so making the switch would be easy. But then another thing popped up. 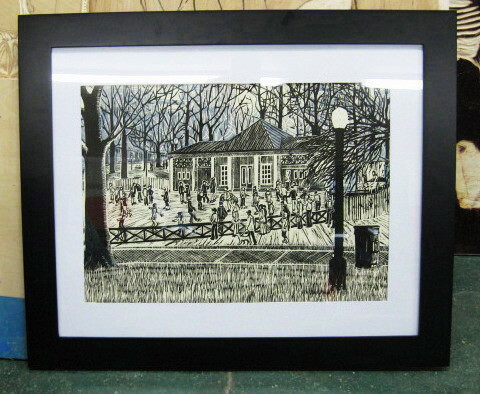 Got an e-mail reminding people that Friday was the deadline for the 40th Anniversary Members Juried show at the Printmaking Center of NJ. I used to be very involved with PCNJ, but not so much lately. I haven't been in a show there since the 36th Annual show two years ago (I'll save the story of how we jumped two anniversaries for another time), or taught a class there since four years ago. 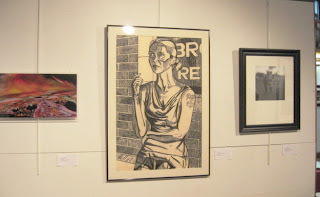 Lately they seem to favor curated shows over juried shows, and the only one that I could have entered was juried by the new master printer. 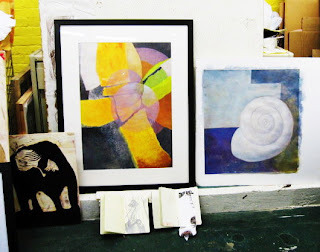 When I looked at her website and saw her work was all abstract, textural, printmakerish stuff I didn't like my chances. Artists who do that kind of work never jury me into shows, and she maintained that tradition. However, this time the juror is Eileen Foti, whose name had popped up regularly on this blog as a friend to me and what I do. Her being the one to select the work is no guarantee I'd get in, but at least I know she's predisposed to like what I do. Two problems. First, I had let my membership lapse, so that would have to be renewed. (used the internet to take care of that) Second, I've been extremely busy the past two years, but don't have a whole lot of prints to show for it, and by rule all the submitted work has to be from the past two years. I only have one big impressive piece from that time period, my smoking portrait, but I'm delivering the framed copy to Rahway tomorrow and the unframed copy would exceed the size limits, and the two shows might overlap, so that's out. That Animal Spirits print became one of my best options, but I didn't have a really good photo of it, so this morning I removed the plexi from the frame so I could get a good photo, then got a quick photo while the print was still held by the frame before swapping it for the saint I need to deliver tomorrow. Again, the internet allowed me to submit the paperwork and the images today, so they are in. Be about a month before I get the results, but I'll have a whole new set of deadline to deal with then. 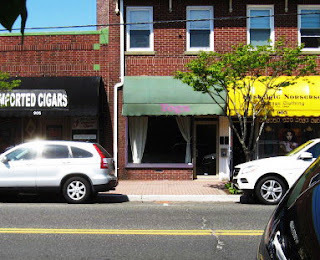 Back in January, then SICA director Doug Ferrari mentioned that he was looking for Asbury area artists for a show up in Rahway, so I sent him a variety of unrelated images, not knowing what was being looked for. Eventually these images ended up on an online database, and about a month ago we got the first information about the proposed show. At last night's critique, Molly mentioned an e-mail that had come in during the day (while I was at work) with more specific information, as Doug had also recruited her to be part of this. I read it late last night, but was too tired to write about it until this morning. 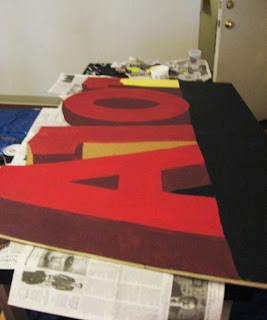 Not long after the demise of SICA, Doug popped up in a new job, assistant director of Arts Guild New Jersey, which was last seen on this blog under its previous name, the Rahway Arts Guild. 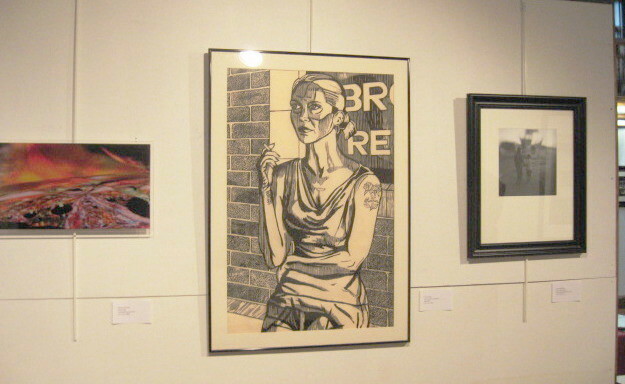 I had 9 prints there in a curated group show back in 2009, and Molly had four. 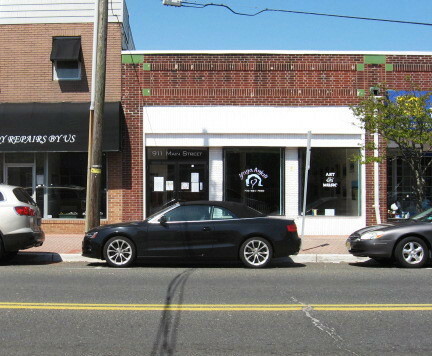 The mission of SICA had been to bring high art (NYC style gallery art) to the Jersey Shore, where most local galleries tend to show beach scenes, landscapes, flowers, and other non-adventurous subjects not likely to challenge or offend the casual vacationing visitor. And every summer, beach towns up and down the Jersey coast (such as Long Branch and Asbury, where SICA was headquartered during its existence) get invaded by swarms of "bennies", a local term for vacationers from out of the area. The MTV Jersey Shore show documented one common strain of bennies. If you are in the hospitality or recreation business, the summer months are your life blood, and the summer holidays are your Black Friday. If you're a year round resident with no financial ties to tourism, you tend to dread the crowds, traffic, and obnoxious behavior that come with this time of year. His pitch for this multi-location group show in Rahway, called "Preemptive Strike," is that before we get attacked by the annual invaders from the north, we shore artists will have an attack of our own, though one marked by culture, and perhaps reminding the people up there that our area is more than just beaches and bars. The new information gives us the locations where our work will go. This show will use all four of the works I submitted. 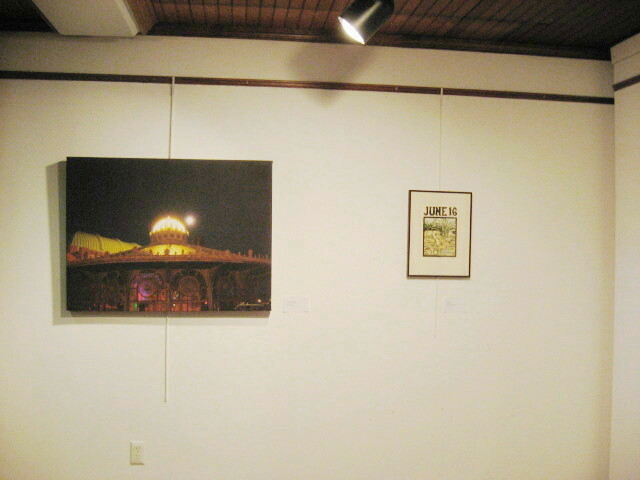 Two prints will be hung in the AGNJ main building, the gallery where we showed four years ago. I will also have one piece each at two other locations, both about 2 blocks down the street from the gallery, so I will be able to distribute the four pieces without having to run around all over town. (some information from the chart is missing for Molly's pieces, but it appears she will have work in at least two of those locations I am in) No word yet as to delivery dates, but the show opens as part of a big street festival in about 3 weeks, so it will be soon. I'll post more details as we get closer. I have to reframe one small piece, but the rest are ready to go. Regulars come and go from our critiques from month to month; everyone is busy and sometimes that means on our planned nights. Eight people turned up tonight, including some who have missed the last few meetings. Still, that's enough for us to have an enjoyable evening of art and discussion. When I arrived Molly had already set up something new right in the middle of the room, and it seemed best to start with her so that we could move her piece before looking at the others. What you see above is print runs of two more in her series of little robots, which she expects to need for an upcoming show in Rahway, details of which I'll post tomorrow. It is the custom in our group for each person who presents to pick the next person to talk about, and Molly selected Mary, who brought the finished version of her multi-block relief print. We all saw the black line part of this image previously, and I saw some of the blue color block evolving during the last round of woodcut classes, but this was the first time we saw it all together. There is a lot more detail in the print itself than can be shown in this photo of the print under glass. Sheilagh, fresh off her painting prize in Belmar, brought in three current paintings. There was a bit of confusion as to the medium- we all figured they were encaustic, due to both their surface quality and her talk in the past of how much the medium excited her, but she insisted they are acrylics. Either way, people are liking the effects she's achieving. Up on the big board we had two pieces from Ani, bringing in the colorful piece just to show everyone how it ended up, and seeking input on two in progress- the piece with the spiral shell and an even more abstract painting attached to the back of that one. Underneath are a couple of sketchbooks from Harriet, who has committed to a sketch a day project for 2013. We passed them around so that everyone could flip through them. I have spent the past 3 weeks painting at the Algonquin theater, averaging 6 or 7 hours per week, so I have no prints to show. Instead, I pulled up a few images on the camera. They are unedited and so kind of dark, but at least it gives some idea of what I've been up to. Looks like we have one more month of Thursday meetings, then the spring semester will be over and we'll likely go back to Mondays. Maybe by then I'll have some new art to show. Word got out that the BAC painters would be reassembling today one more time at the Algonquin for a last painting session. I was assigned to work on stage, adding more of our stone design to the facing areas of the "steps" of the central platform. Having been part of that effort on other pieces last week, I knew what I needed to do. Before today a medium neutral color had been scumbled onto all the facing (front, right, left) surfaces. Pat marked the basic shapes of stones and mortar with chalk while I gathered the paint. I started with a dark gray, painting the mortar lines around the stones. After that, I sponged on a watered down white/yellow mix, matching the "highlights" as painted on the stones for the wall pieces last week. 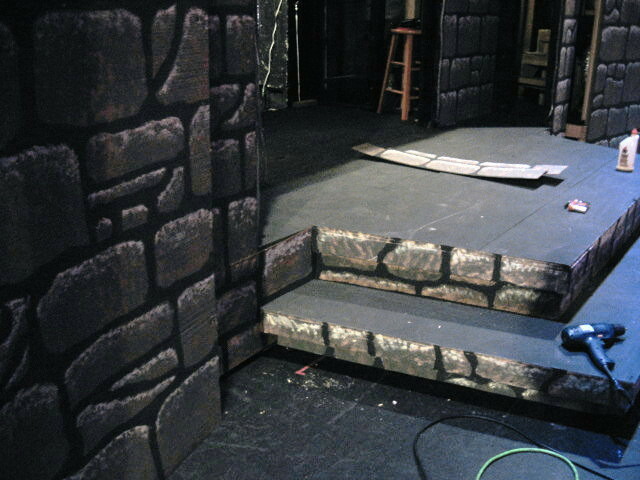 Above, the steps, and a little adjacent piece of wall just to the left, were things I painted today, despite being surrounded by the chaos of other set construction, lighting tests, and a fog machine. 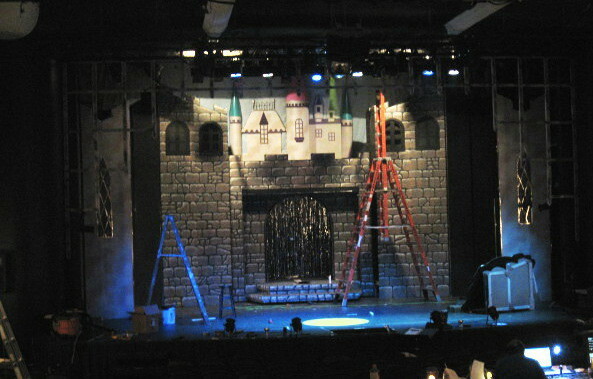 Below, a wider shot of the main set, with the panels in the castle exterior position. That pretty much ends the BAC involvement in this project. The show opens on Friday, so if there is anything else left to be done, someone else will have to be doing it. I'm looking forward to seeing the show this weekend and checking out how my efforts look from the seats. This year's NCAA basketball tournament is now over. My last art school, Syracuse, lost the national semi-final game to Michigan, which in turn lost to Louisville for the national championship in what turned out to be a pretty exciting game. 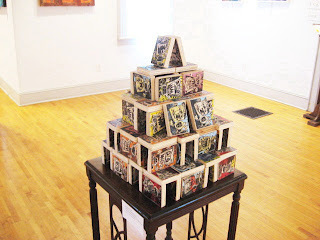 The closest art connection that I have to Louisville is that I used to drive through the city a few times each year on my route back and forth from home to Carbondale, but that's not the same as having art at the university. Maybe I'll have better luck next year. Had some business in Manasquan this afternoon, and decided to drop by the theater afterwards. Partly to see how progress had gone the last couple of days, and partly to look into getting the free ticket I was promised. Got the ticket, right next to ones purchased by family members. Pat told me that there wasn't much painting left to do, but they might need some help with the wall pieces up on the stage. This was indeed the case. Not painting, but construction. Since my last time there they had started constructing the biggest piece of the set, a castle. I helped to raise two of these 20' sections we were painting on Wednesday, and held them in place until they were attached to the rest of the construction. (halfway between a barn raising and building a stone cathedral I suppose) It took a bunch of us to raise a piece of wall that will sit over the central doorway between the towers. Above is a wide shot of the stage showing how this looks. With that done, I decided to retreat back to the painting area. The last part of my day there was spent painting spots on giant wooden dice, the circles already pencilled in place. No problem for spots on top of these boxes (each a 24" cube, resting on the floor with no other place to put them), but painting the ones on the sides was trickier, between dripping paint and that the brush itself blocked my view of the lower part of each circle. I tried to talk Pat into us just going with our own version of Big Jule's custom made dice, but she said no. Some touch up will be needed. I had a free day today, and made plans to put in some more time painting sets in Manasquan. 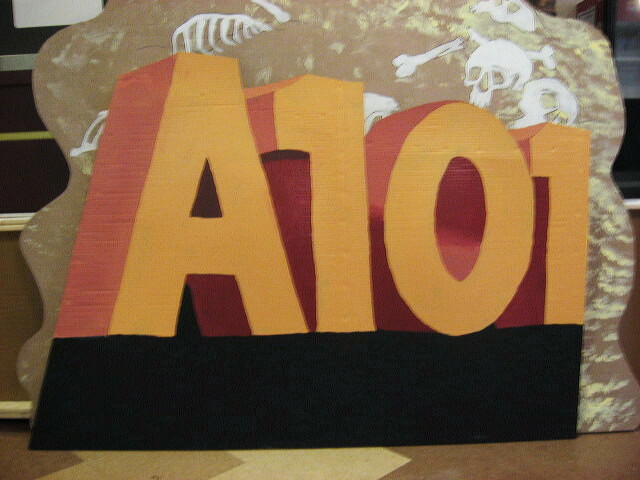 I had dropped by the theater briefly yesterday and Pat had told me she wanted me to work on the A101 sign, which had been sitting at the back of the stage all last week. It was still there, painted to look like what you see above, but there was some technical stuff being done up there today, so I had to bring it out to the lobby. The space we had to work in was a little tight, but we could work on top of tables today and had much better light, so a good trade. The letter/number shapes were fine, but I was told that they needed the letters to be brighter while still maintaining high contrast, so, following given directions, I replaced the red facing part with a golden color, tops and sides with an orange color, and a deep red for the shadow areas. Below is the results. 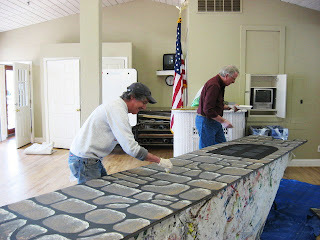 After a quick pizza break, I moved on to the dance space where we had people working on stone walls. Stone painted on corrugated cardboard with a thin wood frame, about 20 feet tall. 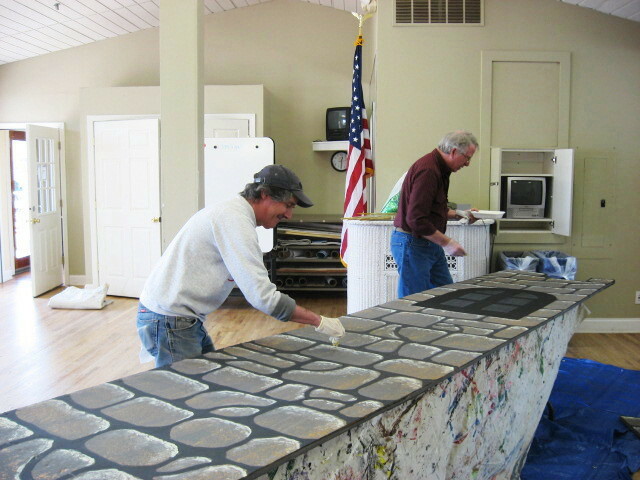 Below, BAC members Ralph and Jim add highlights to make the "stones" feel more three dimensional. They worked on at least four of these today, with me helping on the last two. When dry, we moved them into the theater, setting the lightweight pieces rest on top of the seats. We then moved on to start this stone process on two more large pieces, each including half an arch. We got as far as making the mortar lines between what will eventually be the big stones. Including clean up time, it was a six hour day. Of course, it's never that simple. 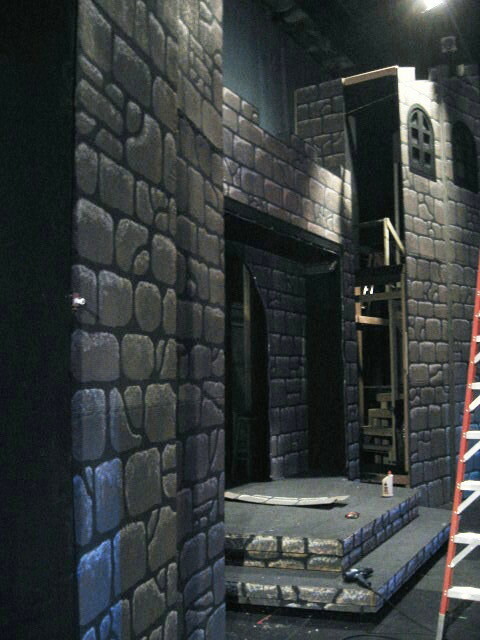 As with all theater productions, there are many people involved in all aspects of the production. 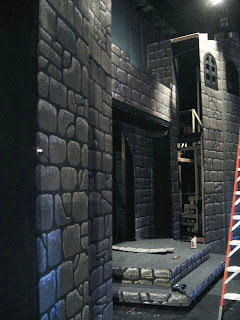 For example, after finishing the four tall pieces of wall, we were prepared to start working on two shorter pieces leaning up against the wall. But then we were told by someone else to forget those for now, and that we should get going on the arch pieces first, orders of the person in charge of the show. Later that boss showed up and said the arch pieces weren't important, but the short pieces we had been told to set aside absolutely had to be done by tonight. The person who had switched us from one to the other took the blame, the process for us was the same either way, and it was my quitting time, so not my problem. And my sign from earlier, on the way out I was told that now the word was it was to be made to look like stone. Again, now someone else's problem. Theater people have been causing me problems going back to William and Mary, when they would invade our studios looking for places to practice screaming at each other, and I would have to throw them out so I could get my work done. Twenty-five years later, things aren't any better. We're now through two weekends and four rounds (I don't count those play in games as a round) of the NCAA basketball tournament. Still one art school alive- Syracuse made it to the Final Four, as my brackets predicted. Not really a daring prediction; though only a 4 seed, many people put them in that spot. One other of my Final Four teams (but not one of my art schools) also made it through, fellow Big East team Louisville, also predicted by many to make it this far. Not predicted by me, but a pleasant surprise, is that Wichita State won the West region. No art connection, but they are part of the Missouri Valley Conference, home of my Salukis, who haven't made it to the dance in a few years. Next week we'll wrap up this year's art tournament, one way or another.